Cool country. Spud country. 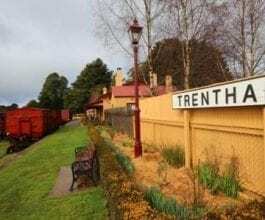 For a tiny town, Trentham packs a punch. Not just what it is famous for – but for its lesser known gems too. A quaint village retaining many historical buildings and a charming streetscape also boasts drop-dead pretty botanical gardens and shady tree-lined streets (not to mention the main street has even featured in several movies, but Trentham is too modest to boast of such things). Situated half way between Woodend and Daylesford and located high on the Great Dividing Range, Trentham’s soil is fabulous for growing some of the country’s best spuds along with a veritable cornucopia of seasonal produce. From chestnuts and cherries, to heirloom fruits and olives, there isn’t much that won’t flourish in this rich volcanic dirt. It is therefore unsurprising that whilst the picturesque main street is not large, it boasts some of Central Victoria’s most exciting foodie destinations. From award-winning French farmhouse restaurants, to bakeries turning out award-winning sourdough breads. You can wander the street and enjoy cuisine from casual to elegant, in front of open fires in winter or under a canopy of trees in a magnificent beer garden in the warmer months. Come in Winter and you might just be lucky enough to be here when the marvellous truffle season fleetingly appears and go scouting the truffière for these magical underground treasures. 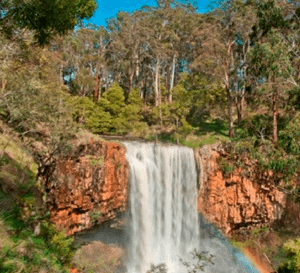 To work up an appetite, or work off the previous days indulgences, a trip would not be complete without a visit to Trentham Falls, Victoria’s highest single-drop waterfall. Truly spectacular when in full flight, you can find yourself wandering paths through beautiful old trees, enjoying a picnic with the crescendo of water in your ears or simply enjoy the sounds of native wildlife. 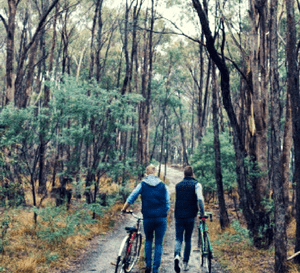 If you’re up for a more energetic adventure, the region boasts some of the best forest tracks that can be enjoyed on foot, on bike or even horseback. 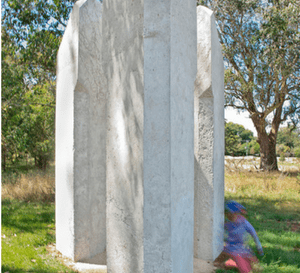 One of our favourites is the picturesque walk from Trentham that ends at the Radio Springs Hotel in nearby Lyonville. An icy cold lager or savoury local shiraz is just the thing to reward such exertion. Trentham is a lovely country village filled with character, interesting stores, cute cottages, gorgeous gardens and superb accommodation. It is the perfect place to linger and unwind. While Trentham may look merely like a sleepy country village, take a look around and you will find yourself in a foodie heaven. Trentham and the surrounding area is a hub for organic food and wine, home to orchardists, beekeepers, winemakers and farmers. Gourmet food products, freshly baked sourdough loaves, tantalising menus, top coffee and wine lists that would be the envy on many of the top restaurants in Melbourne await. Natural produce is a proud trademark around here. From innovative restaurants, award winning organic producers and cafes, to farmers markets and farm gate goodies, foodies will delight in the sumptuous range on offer. One of the founders of the paddock-to-plate movement, highly acclaimed author and chef Annie Smithers’ has set up shop with du Fermier, her French farmhouse eatery, where diners happily wait weeks and even months for a prized lunch time reservation. Equally popular is award winning Red Beard Bakery, turning out steaming sourdough breads and pizzas in its 120-year-old scotch oven. One of Victoria’s oldest weatherboard pubs, the Cosmopolitan Hotel has a simply breathtaking beer garden and locals and visitors alike enjoy the local seasonal pub fare and craft beer on tap. These and many more exciting dining options await you on your visit to Trentham.